WASHINGTON–The United States mistakenly supported China’s membership of the World Trade Organization in 2001 during Bill Clinton’s presidency on terms that have failed to force Beijing to open its economy, the Trump administration said on Friday as it prepares to clamp down on Chinese trade. “It seems clear that the United States erred in supporting China’s entry into the WTO on terms that have proven to be ineffective in securing China’s embrace of an open, market-orientated trade regime,” the administration said in an annual report to Congress on China’s compliance with WTO commitments. 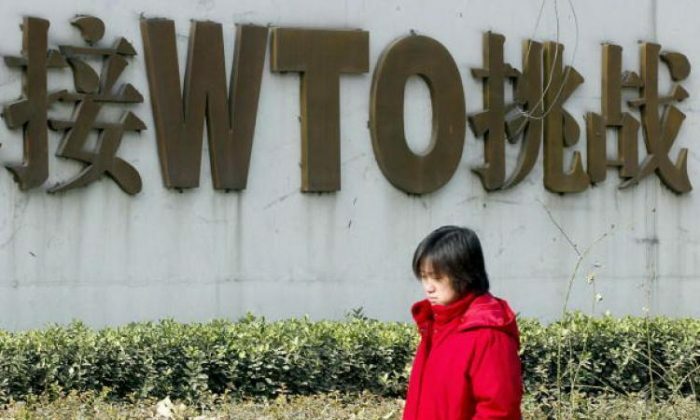 “It is now clear that the WTO rules are not sufficient to constrain China’s market-distorting behavior,” the report said. While the annual report from the U.S. Trade Representative’s office has long taken China to task for unfair trade practices, the first such review under U.S. President Donald Trump takes a stronger tone against Beijing. It comes amid worsening trade tensions between the world’s two largest economies and as the administration prepares actions to curb China’s alleged theft of intellectual property. A decision in the so-called “Section 301” investigation is expected in the coming weeks. A White House official said despite consultations with China, it had failed to follow through on promises of moving more toward a market-orientated economy and playing by international trading rules. “The president and his principal advisor are united in the belief that this is a problem that has gone on for too long and needs to be addressed,” the official said. “In the past, conversations have focused more on discreet opening for discreet products, and what we’re saying is systematically we’re not going to tolerate broad-based policy that attempts to promote state-led enterprises,” the official said, speaking on condition of anonymity. Trump told Reuters in an interview this week he was considering a big “fine” against China for forcing U.S. companies to transfer their intellectual property to China as a cost of doing business there. While the administration is also looking at whether foreign imports of steel, aluminum, washing machines, and solar panels are harming U.S. businesses, China’s theft of intellectual property is a particular concern to Trump because it affects a large swath of American firms, the official said. Trump did not specify what he meant by a “fine” against China, but the 1974 trade law that authorized an investigation into China’s theft of U.S. intellectual property allows him to impose retaliatory tariffs on Chinese goods or other trade sanctions until China changes its policies. In Beijing, many experts believe Washington is unwilling to pay the heavy economic price needed to upset prevailing trade dynamics between the two countries. In the report released on Friday, Trump’s trade envoy, Robert Lighthizer, said the global economy was threatened by major economies who undermined the global trading system. The Trump administration has already pledged to transform 164-member trade body and has blocked WTO judicial appointments in a move to win WTO reforms. “What we want to do is see countries behave responsibly within the international trading system,” the White House official said. How is State Capitalism in China hurting both the Chinese people and China’s trade partners?